If you like living in the Myrtle Beach area, close to all the excitement of the Grand Strand, but long for a neighborhood full of Charleston style, take a look at Creekhaven! This Prince Creek subdivision in Murrells Inlet features one of the most outstanding coastal living experiences on the Carolina coast. These homes offer spacious 3-4 bedroom floor plans, ranging in size from a little under 1,300 to about 3,100 square feet, priced from $170,000 to $250,000. With features like gourmet kitchens, custom cabinetry, incredible master baths, walk-in closets, screened porches, and more, you will be proud to call one of these houses your home. The community is bordered by natural wooded areas and landscaped ponds. 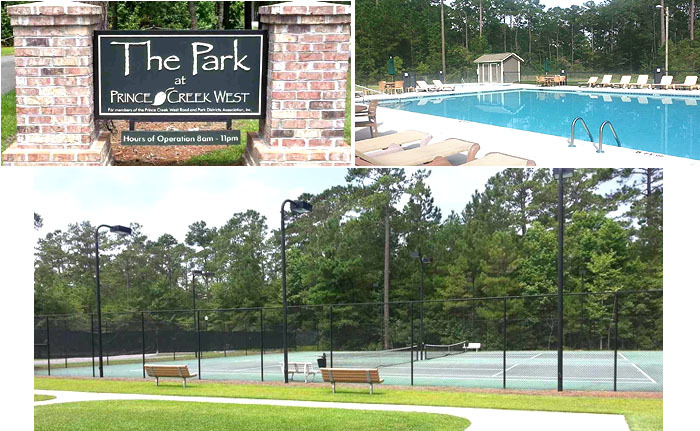 It has a 41-acre gated park with 2 pools, a covered picnic pavilion, tennis courts, and more. The neighborhood’s lakes and ponds are lined with cypress, pine, and oak trees, providing a natural habitat for a multitude of indigenous wildlife such as otters, great blue heron, and swan. Schools, shopping, dining, professional services, and entertainment are just a short drive away. The Marsh Walk at Murrells Inlet is home to some of the finest seafood restaurants. A few minutes away there are ample opportunities for beachcombing, fishing, hiking, swimming, and educational activities at Huntington Beach State Park, the formal Gardens at Brookfield Gardens, and all the excitement of the Grand Strand. Whether you are looking for a vacation get-away, a primary home for a growing family, or a retirement home, this community has everything you need for an extraordinary life. To learn more about CreekhavenHomes for Sale visit our website and call our real estate professionals to schedule a private tour of any Prince Creek subdivision.